I RECEIVED THE FOLLOWING GUESTBOOK EMAIL FROM A HAMILTON HORNET FROM HHS '54. I FELT THAT A RESPONSE WAS IN ORDER. IN CASE THE WRITER PREFERRED ANONYMITY, I WILL ONLY USE HER FIRST NAME. UNFORTUNATELY, THERE WAS NO RETURN EMAIL ADDRESS. ACCORDINGLY, I AM USING THIS POST TO RESPOND. MARION, MANY THANKS FOR THE COMMENTS. I HOPE YOU WILL BE A REGULAR VISITOR TO MY WEBSITES. AS YOU HAVE PROBABLY SEEN, THIS, AND MY KUSER SCHOOL WEBSITES HAVE FEWER POSTS THAN FOUND IN MY MAIN WEBSITE, WWW.GLOVER320.BLOGSPOT.COM. YOU ARE A CLASSMATE OF MY FRIEND, GIL LUGOSSY. 1954 IS ONE OF THE YEARBOOKS WHICH IS NOT INCLUDED IN MY COLLECTION. Tom, It is a pleasure to see how diligent you have been in keeping the past alive! What a thrill! 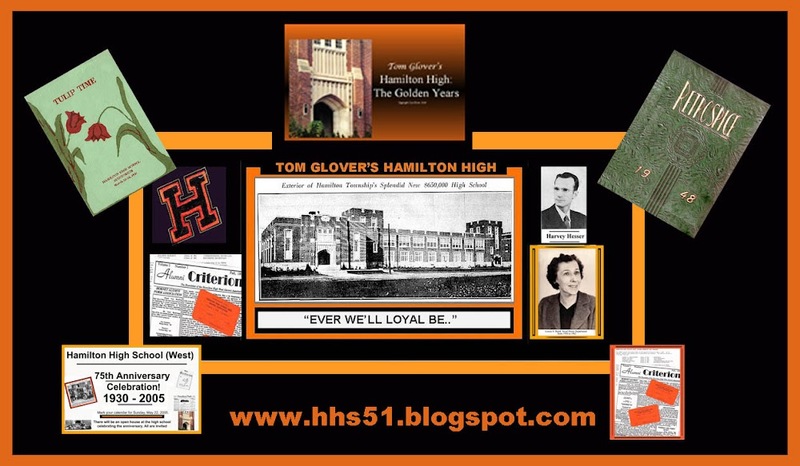 I was raised in Hamilton Twp since the age of 2 and was graduated from HHS in 1954! I am married to my best friend for 47 years, have three kids, who are all married and have presented us with 9 grandkids! We are still living in the house we built 41 years ago in Yardley. I am retired after 37 years of work as a Master's level nurse (full scholarship, U of P for both bachelor's & master's degrees! I served after retirement as a consultant to the CDC & HRSA, MCH, Genetic Disease Branch in the field of newborn genetic screening! I LOVE your site & will send you some of my photos as well. Keep up the great job!